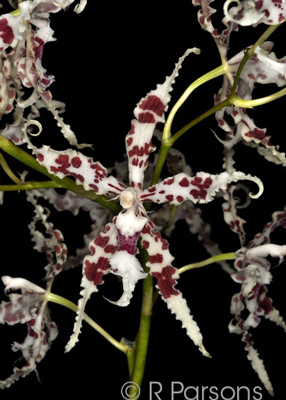 Odontoglossum lucianianum outcross #2289 (approximately 25 seedlings per flask). This cross was made by Steve Beckendorf from plants in his collection. This is the first time this has successfully been germinated in flask. 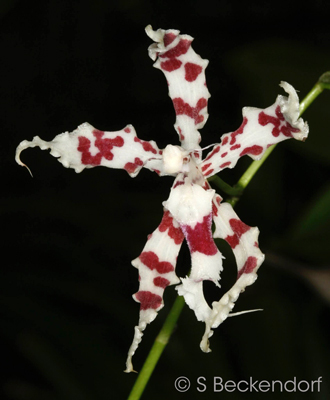 The Species: This very uncommon species is only from Venezuela where it grows at elevations from 6600 to 8900 feet. It is a medium sized plant and a mature plant can produce up to 35 flowers on the 16" inflorescence. Culture: This is a cool growing species that should have good quality water, dilute fertilizer year round. It is an epiphyte in nature but grows well potted in bark. 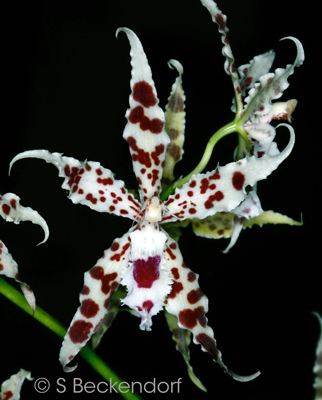 Odontoglossum lucianianum images. I do not know which was the capsule parent, but you get a good sense of the flowers.